Choosing a cylinder for an engine is not always that easy that is if you are looking for performance. Here is a chart of Cox cylinders and their numbers. 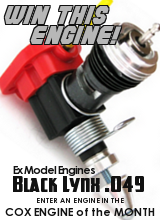 1 Used on early Black Widow and 290-291 series engines. 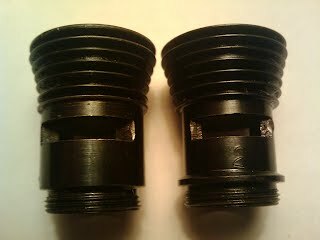 2 bypass, sub-piston induction, some cylinders had milled top fins and some older ones didn't. 2 Used on Golden Bee and older Babe Bee engines. 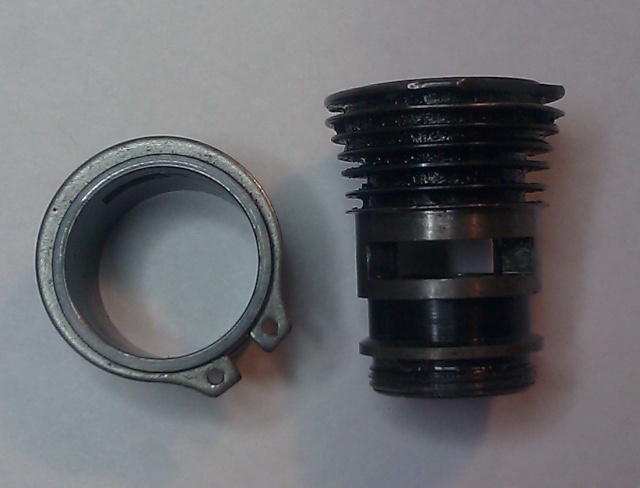 Single bypass, sub-piston induction, top fin not milled. 3 This number was used on lots of different cylinders. 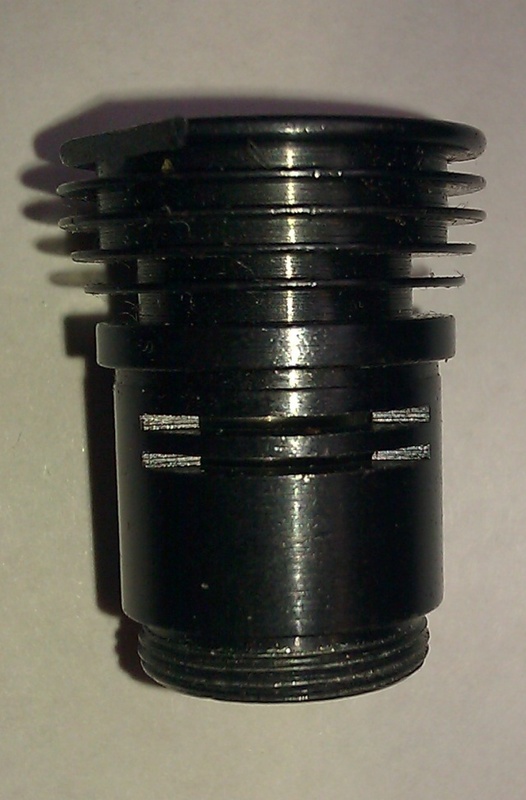 The Venom used a #3 (or 4, see below) cylinder that was 2 bypass, 1 booster, sub-piston induction, tapered, top fin milled. 4 Used on T.D. .049 engines. 2 bypass, 2 booster on each bypass, each with 3 separate milling cuts, sub-piston induction, top fin milled, has tapered grind. 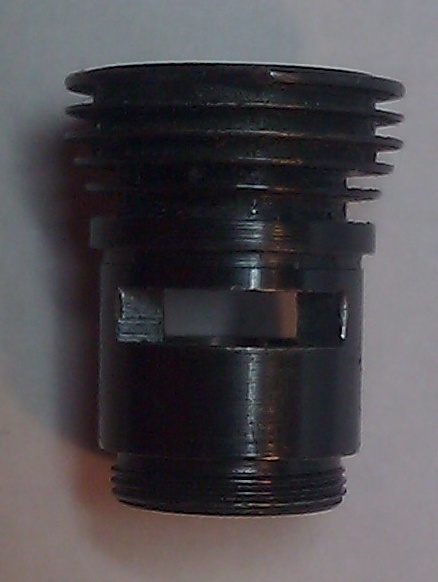 Sometime in the 1980s, TD cylinders were no longer tapered. This number has also been seen on the Venom .049 which is a 2 bypass, 1 booster, sub-piston induction, tapered, top fin milled. 5 Used on T.D. .051 engine. 2 bypass, 2 booster on each bypass, each with 3 separate milling cuts, sub-piston induction, top fin milled, has tapered grind. 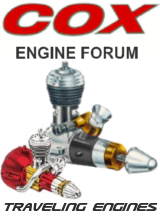 8 Product engines and car engines. single bypass, narrow exhaust, no sub-piston induction, top fin not milled. 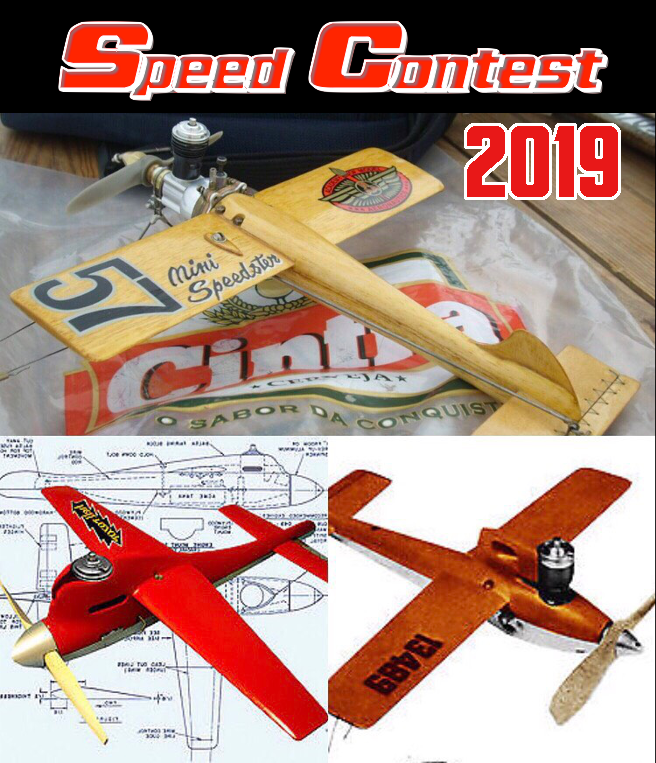 0 Used on product engines, 2 bypass, no sub-piston induction, top fin milled. P-40 Used on the "Super Bee" .049 engine, came on the ready-to-fly P-40 planes 1959 through 1961. 2 bypass, sub-piston induction, top fin not milled. 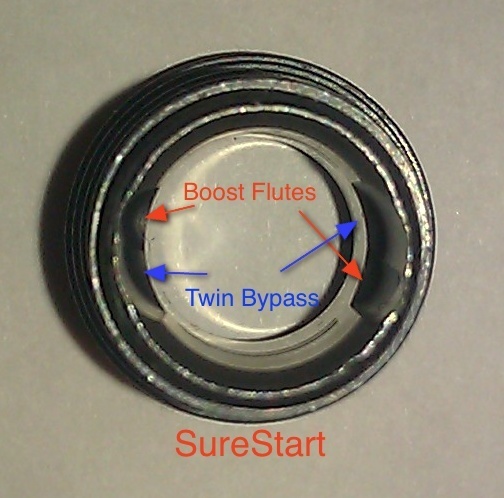 (.049/.051) 2 bypass, 1 boost port on each bypass, top fin milled, has SPI, has tapered grind. 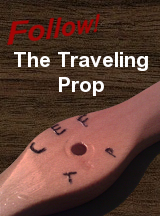 2 bypass, 1 boost port on each bypass, top fin milled, has NO SPI, no tapered grind. From top to bottom, left to right. 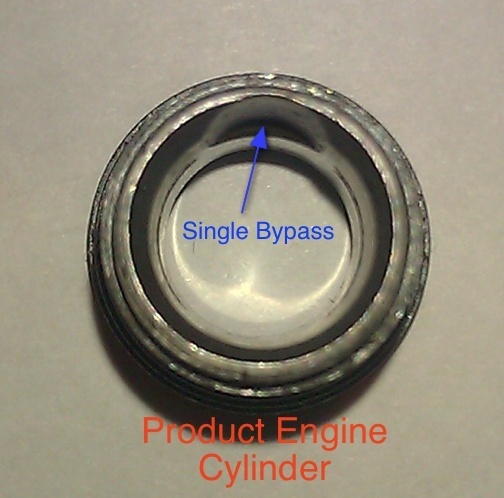 Thinner style cylinders can be found on engines made before the 1970s. They can run much cooler due to their thin walls. But can be damaged more easily when removing/replacing or in a crash. 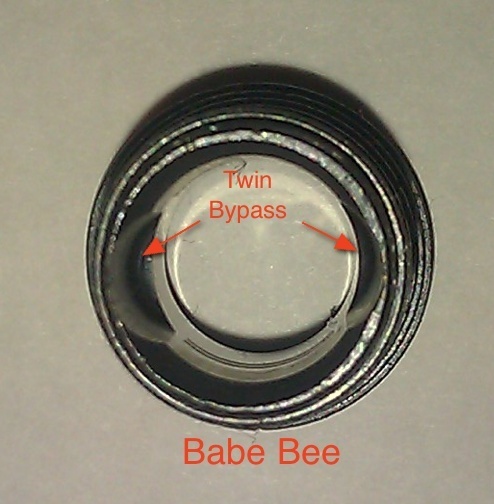 They are both #2 cylinders, the one on the left (the average one) is off a 1978 Babe Bee and the one on the right (the thin one) is off a 1962 Babe Bee. 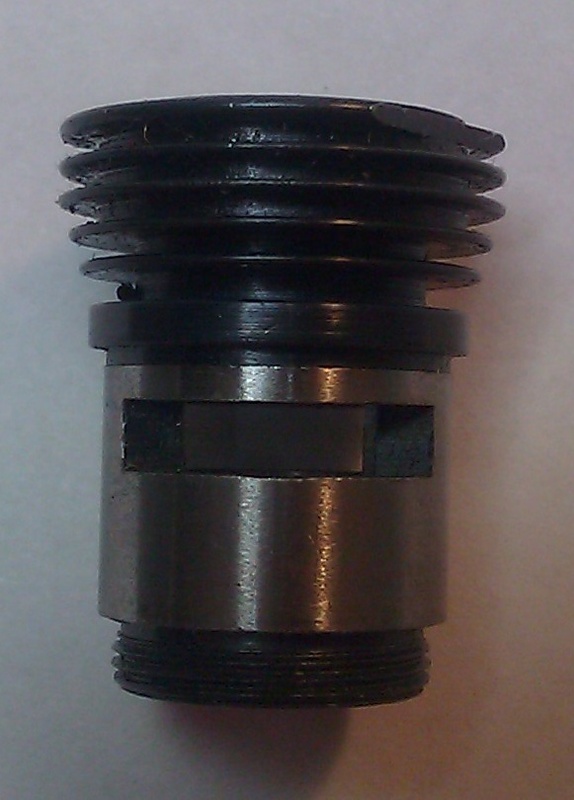 In Feb of 1956, Cox switched over from the small diameter cylinder/head threads to the current size. If you spot any issues at all on this list, PLEASE let me know! It would really help!